Thermal mass and insulation are the two primary characteristics that describe an oven’s ability to absorb and hold heat, making it useful for cooking. An oven’s thermal mass describes the part of the oven that “absorbs and reflects heat from a fire,” so that it is available for cooking. 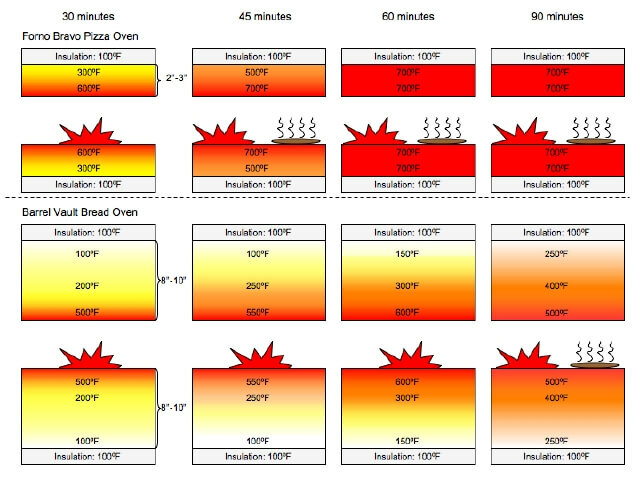 Insulation describes the oven’s ability to “stop heat from escaping,” or leaking out of the wood fired pizza oven—where it is lost to the air. The thermal primer of a wood fired pizza oven can vary widely, from a thin, natural clay shell to a massive 12″ thick brick bread oven. When considering which oven is right for your application — whether it is in your home, restaurant, or food truck, there are a number of factors to take into account. Too much thermal mass is very bad. Heat, like most things in nature, likes equilibrium. If one side of a thermal mass, such as a block of concrete, is hot and the other is cool, nature will try to balance that heat by moving it from the hot spot to the cool spot — eventually reaching an equilibrium where everything is just warm. In a wood fired oven, this means that you want the entire thermal mass of the dome and cooking floor to be fully heated when it is time to cook. If they are not (if the inner face of the oven is hot, but the outer areas of the dome and floor are still cool,) then heat on the inside faces of the oven will “wick” away from the oven chamber in an attempt to create equilibrium in the whole thermal mass. For example, if an oven built from scratch or an extremely thick brick oven requires six hours to fully heat up the oven’s thermal mass, that oven will not cook correctly for the entire six hours it is heating up. Even though you are adding more and more fuel, heat is continually moving away from the oven chamber as fast as you can replenish it. With this design, it is virtually impossible to maintain the high heat required for the perfect Pizza Napoletana. At the same time, too little thermal mass can also be problematic. While a thin clay oven shell might heat up quickly, it does not possess the heat mass or holding ability to cook larger volumes of food, larger numbers of pizza, or bread. A thinner oven will start giving up its heat as soon as its fire has stopped, creating a range of problems for the chef. The food itself will also absorb heat from the oven floor, increasing the speed of cooling and increasing the time it takes to be ready to cook the next pizza or course. For our commercial ovens, Forno Bravo uses domes with 3″ – 4″ of engineered refractory material and 4″ – 6″ of ceramic thermal mass insulation. Because of the extra thermal mass, the commercial ovens take a little longer to charge up fully, but are able to hold their heat far longer and can process large volumes of food at consistent temperatures. They are real workhorses!